This race was a spur of the moment decision and I’m not going to lie, it was for the medal. 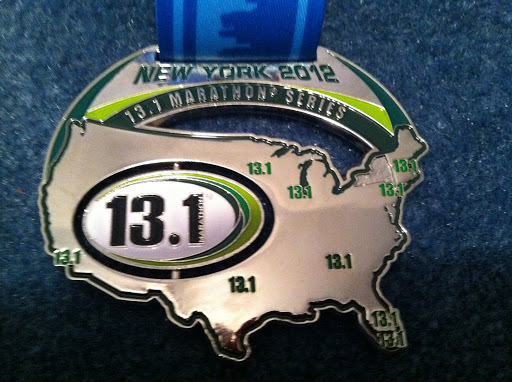 Not the 13.1 medal that every finisher gets, but the NY-NJ challenge medal available to the first 250 people who register to run both the Allstate New York 13.1 and either the New Jersey Marathon or Half Marathon. 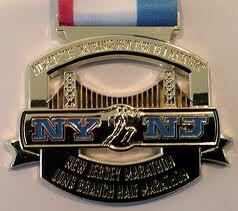 But with that being said NY is a state we haven’t run yet and I doubt my mom will ever run the NYC marathon, so she decided that she wanted to run this one and I had no issues with signing up especially for the cool medal that we will get after NJ and the recognition that comes with it. 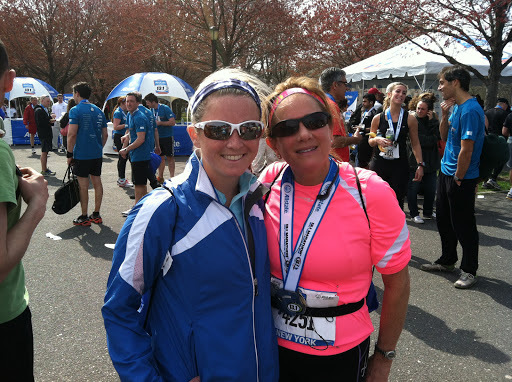 The race is held in March on a Saturday (which was very surprising to us as most of the races we run are on Sundays), and it is a part of the 13.1 marathon series put on by U.S. Roads Sports and since I am already a fan of the company as I have run two of their other races, I knew they would put on another excellent event as well. If you ever would like to take part in one of their races, the series also takes place in Boston, Dallas, LA, Chicago, Miami Beach and Fort Lauderdale. The course took you through Flushing Meadows Park, right next to Citi Field (Mets stadium), where the world’s fair was once held. My mom loved the location because she came here once as a kid and hasn’t been back since as we usually stick to Manhattan. The start and finish line weren’t in the same spot, but they were within close walking distance. Gear check was at the finish line and pretty much it was a system of attach your number to a bag and put it in the corral where some guys watch it and check your bib numbers when you leave with your stuff. The one thing I was worried about coming into this race was the course and if you take a look at the map it seems rather confusing. But when you run it, it wasn’t an issue to follow. The course was mainly flat except for one bridge, but it wasn’t paved all that well as this was a park we were running through and not the streets of say Miami. I could have done without the muddy section, but that was because of the lake and marsh we were running around at mile 7 and 8. But seeing the bustling park with all of the kids out playing soccer and tennis and enjoying their Saturday, was adorable. It was pretty historic with all of the statues where the world fair once took place but be prepared for the smells of the zoo because they are distinct. The water stops were ok, but it made me more appreciative of the Gatorade at the other races, as this one they had Powerade. There also wasn’t any GU provided. The after party was a lot of fun and probably the most fun I have ever had at a race with dancing and the very interesting but enjoyable Funkadelic band (I think that was their name). I especially enjoyed the NYC bagels, egg rolls and pita bread that was provided. BY THE WAY… To anyone who wonders why family members and friends get up early in the morning to stand around for a couple of hours watching their loved ones run a race, well it’s because it gives us that extra boost along with a smile on our face when we see people that we care about cheering us on. This race had about 4500 people so there were spectators present, but not very many throughout, mainly around the finish line and the bridge. It was an easy race for spectators because we ran in circles. Perks– Parking wasn’t a huge issue as most people took the subway to the start. The race had a later time start than I was used to at 9 am so that meant more sleep. The post race food was great and the after party was rather fun. Ehh… Not a Fan: I wasn’t a fan of the race shirt they handed out as the color wasn’t pretty and it wasn’t made specific for NY, but they were selling gear for purchase. The course was muddy in a little area and not paved well and for some reason the race was on a Saturday. Which meant that we had to pick up our bibs on Friday and in the city, not Queens. The medal was big as are most of the U.S. Road Sports but it wasn’t anything special. Overall, I think I enjoyed the after party more than the actual race but it was still an experience in NY. However, I would recommend putting your name in the lottery for the NYC Half or Full marathon if you want to run a big race in NYC. But if you don’t get in, then give 13.1 a try.